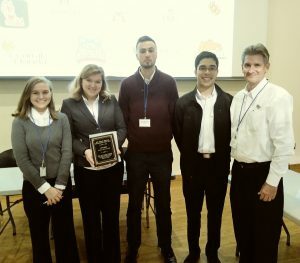 The UCF Ethics Bowl team is heading to the national Intercollegiate Ethics Bowl for a second year in a row, after placing second at the 2018 Mid-Atlantic Regional Ethics Bowl at the University of North Georgia. Joining UCF in qualifying for the national competition are Samford University and Clemson University, who placed first and third respectively, out of the 18 teams who competed in the regional ethics bowl on November 17. The UCF Ethics Bowl team consists of Natalie Hintz (sophomore, mechanical engineering), Derwin Sanchez (freshman, philosophy/writing & rhetoric), Matthew Shalna (junior, philosophy/political science), and Madison Stemples (junior, philosophy). The team is coached by Dr. Michael Strawser (Philosophy) and Dr. Madi Dogariu (Burnett Honors College). The 23rd Intercollegiate Ethics Bowl Competition will be held in Baltimore, Maryland on March 2-3, 2019.